Want To Live A Youthful, Energetic, Long And Happy Life? The Simple Secret To Perfect Health, Effortless Weight Loss, Unlimited Energy & Happiness, AND A Longer Life! Well... it's not! It's 100% real, and it's 100% possible. Whether you're a man, woman, grandchild or a grandparent, this website could change your life forever. What if you could have all these things and more - would you be interested? If you're anything like me and most people, you'd be happy to get just one or two of the benefits listed above, right? Keep reading to discover the secrets to a happier, healthier, longer and more fulfilling life. And as you read through the rest of this website, allow yourself to imagine your life changing, starting today. 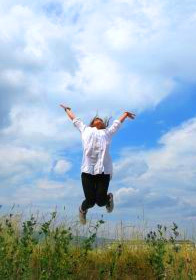 Imagine yourself feeling stronger, sharper, healthier, more energetic, more flexible, more powerful, more... alive. Imagine all of your aches and pains disappearing, your worries and anxieties fading away. Imagine yourself at your absolute best, your peak, the ultimate you. 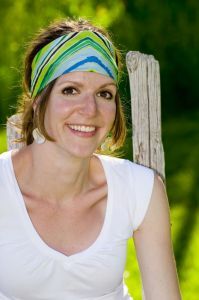 The Incredible Power Of Natural "Superfoods"
Hello, my name is Sarah Short, and I'm a superfoods fanatic. I don't want to talk about myself too much since today is all about you, but I wanted to let you know how this website came about. Like you, and like many other people, I spend my life looking for ways to improve my health and my body, to avoid illness and to live my life to the fullest. I've always had an interest in diet, nutrition and wellbeing, and I strongly believe that what you put into your body determines what you get out of life. Think of it like a car. If you put good quality fuel into the car it runs smoothly and goes at top speed. Your body is no different. You have to put the right "fuel" in to get the best results. Having lots of energy, sleeping soundly, being fit and active, staying young, keeping healthy and living longer... all these things are the result of having the right fuel for your body. Put simply: to keep your body running at its best, you have to eat the right foods. When you eat right, your body will turn into the perfect example of a healthy human being, and you'll feel and see the change in yourself. - You'll start to notice all the little aches and pains that used to bother you are suddenly not there any more. - You'll start to notice that you sleep soundly as soon as your head hits the pillow, and that as soon as you wake up you're ready to go. - You'll start to notice that you feel more energetic all day, and that you're not ill as often. - You'll start to notice other people complimenting you on your youthful vitality, good skin and beauty. I wanted all of these things just like you do today. Years of continual research has led me to a few key "super" foods over and over again. Protection against cancer and heart disease, rapid and natural weight loss, immune system boosting, improvements in your vision, keeping your brain working at its best and literally hundreds of other benefits. At first I was skeptical, as I'm sure you have been at some point. But the more I looked into superfoods, the more it made simple and perfect sense. Put simply, superfoods are foods which are absolutely jam packed with vitamins and minerals, more so than regular foods. They're also foods which have health benefits beyond their nutritional content. Most of these extra add-on benefits come from various natural compounds found in plants and animals, called "phytonutrients". Some of these phytonutrients have special powers on their own (such as improving skin tone and eyesight), and some are "antioxidants". Antioxidants fight against free radicals (bad cells) in the body and are linked to prevention of many serious diseases, notably heart problems and cancers. Why Are Superfoods So Great? For one thing, they're completely natural. In fact, the more natural and organic they are, the more powerful and healthy they become! For another thing, we've been eating some of these foods for 5,000 years or more. Even that long ago, our ancient ancestors knew these foods were good for their health. Unfortunately, a lot of what they learned so long ago has been lost over time, and only now are we starting to rediscover it. Superfoods have been used in traditional medicines almost since time began, but now is science starting to catch up with what traditional culture has known all along. Advances in technology mean we better understand the biological processes inside our own bodies, and how these foods impact those processes in a good way. Medical and nutritional scientific research is proving that these superfoods are not just good for you, they're GREAT for you. They support and supplement your body to make it the best it can be, in every way. It is now possible to carefully select your diet to get the best nutrition you've ever experienced. Obviously you don't want to spend weeks or even months rummaging through boring and long-winded research papers, so I've done the hard work for you. The "Simple Superfoods" list is a collection of the top 30 most nutritionally dense and most powerful superfoods on the planet today. This list is the result of my extensive and thorough investigation into ancient culture, traditional medicine, huge demographic diet studies, and medical and scientific research papers. I've pulled together absolutely everything and produced a definitive list of the most amazing 30 foods you will ever eat. Best of all, these foods are all natural and available in your local supermarket! Do you want any of these? The list includes foods that are as good as a $100 dollar pot of the finest designer face cream, they're that packed with nutrients to firm, tone, smooth and revitalise your skin. We all want to live longer to be with our families for as long as possible. To see our children and grandchildren grow up and be happy, to enjoy our hobbies and passions and savour every single second of a passionate relationship. The superfoods in the list not only have anti-aging properties, but they'll also protect you from serious diseases like heart failure and cancers. With a lower the risk of those diseases, your life expectancy could be longer. 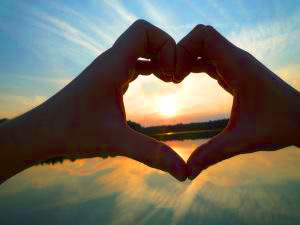 Heart disease is one of the world's biggest killers today. Caused by many things, such as high cholesterol, high blood pressure, hardening of the arteries and weak or thin blood, heart disease kills one person every 34 seconds in the United States alone. BUT... you can drastically reduce your chances of suffering from heart disease with the superfoods in my list, and live your life with a strong and healthy heart. Disease and illness is a constant worry for everyone. Nobody wants to get hit with any bad news about their health. Heart disease and cancers are the worst. I don't need to tell you how serious it is if you develop one of these conditions. 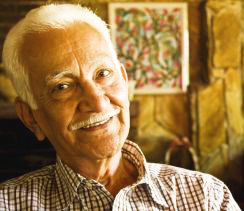 The foods in my list are backed with scientific research which show they may be able to help prevent and reduce the effects of cancers, and help defend against other serious diseases ranging from diabetes to Alzheimer's and Parkinson's. Poor sleep patterns can seriously ruin your life, because every day becomes a struggle to stay awake and stay focused. Interrupted sleep happens for many reasons, but most of them can be corrected with simple changes to your diet. There is at least one superfood in the list which is reported to rebalance your internal "sleep clock" to help you sleep like a baby and get you back on track in no time. 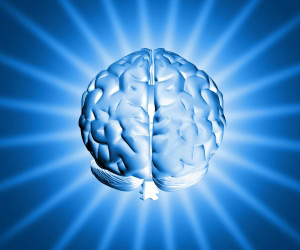 Your brain is the most complex organ in your body, far beyond complete scientific understanding. However, we DO know that certain foods can help keep your brain sharp, help avoid the natural decline in mental health as you get older, and fight off serious mental conditions. Not only that, but keeping your brain sharp will also improve your concentration, memory, mental agility, alertness and much more. Do you ever have days where you just don't have the energy to do anything? Once you introduce the "Simple Superfoods" into your daily routine, you won't ever have them again! My superfoods deliver long lasting natural energy that will keep you "on task", focused, concentrated and always ready for the next challenge, all day, every day. 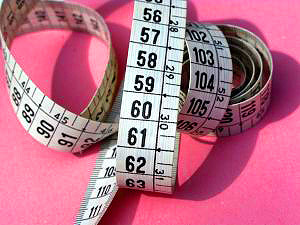 We'd all like to be a bit slimmer, and thankfully it's not that hard once you know the secrets. There are some foods which do two things: first, they help break down fat in the body so the body can use it more quickly, and secondly they stop fat from accumulating in the first place. This powerful combination means you can easily and naturally control your weight and stay slim. As we talked about earlier, your body is like a car. When you put the right fuel in, it runs like a Formula 1 race car! My superfoods will let you do just that, and your body will become a model example of perfect human health and fitness. This Is The Real Deal... Not Some Crazy Fad! You might have seen products on TV and in the news recently, promising amazing things if you eat a few berries or drink a magic potion. They often sound incredible, but don't be fooled by their marketing hype. They want you to sign up to monthly subscriptions for bottles of pills, often charging $49.95 per month or MORE. And then as soon as they discover the next big craze, they'll start trying to sell you that too, for another $49.95 per month! Or worse, they are simply lying to you. Several companies have been sued and shut down for fraudulent marketing practises in recent years because of not being able to back up their claims with scientific fact. But that's not the case for the "Simple Superfoods" list. You see, everything in the book is based on the research that the wider scientific community is doing, and on thousands of years of experience from ancient tradition and the world's healthiest cultures. These foods are NOT fads - they're not going anywhere, they're not expensive, they're all natural and there's no outrageous subscriptions to pay! Some of the world's oldest people attribute their jaw dropping longevity to the foods in this list. For example, Jeanne Calment (the worlds oldest person ever) lived till she reached the unbelievable age of 122! 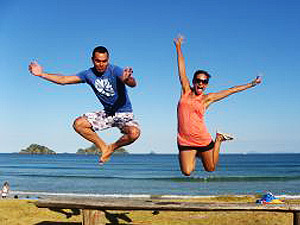 She listed 3 of my superfoods in her everyday diet and considered them part of the reason for her incredibly long life. 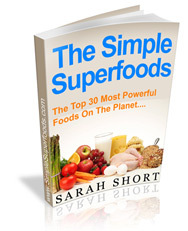 "Simple Superfoods" is available today for $49.95 - SPECIAL OFFER: $29.95 (until the end of April). That's less than $1 per day! Plus, if you order today you'll also receive a copy of my Natural Herbal Remedies guidebook. - Learn the natural health concepts: Hydrotherapy, Herbalism, Eclectic Medicine and Natural Hygiene. - Learn which natural herbs have a combined medicinal and culinary purpose you can use to enhance your health and lifestyle. - Learn the dangers of pharmaceutical drugs and how you can avoid the bad drugs and pills. - Learn how the Chinese combine their natural medicinal herbs. 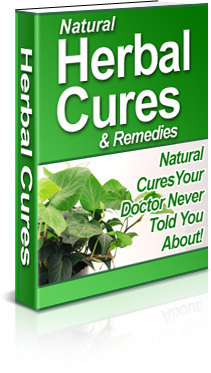 - Discover natural cures to treat all kinds of disorders...like the common cold or preventing influenza. 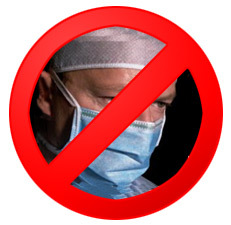 - Learn one of the oldest forms of health care dating back thousands of years. Alternatives that are very safe with no side-effects. Worth at least $29.95 on it's own, when you order today you'll get the Natural Herbal Remedies ebook at no extra cost as a free gift from me. To make this an easy decision to for you, the "Simple Superfoods" package comes with a guarantee so strong even Superman himself couldn't break it. "Simple Superfoods" is a digital product. That means it comes as a PDF file which you can download onto your computer immediately after your payment. Use the form below to order your copy of the "Simple Superfoods" list right now, and begin your journey to health and happiness today. YES! I want to sleep better, be more awake, have more energy, have smoother and firmer skin, pretect myself from disease, be healthier and live life to the max. I understand I'm buying a digital ebook which I can download immediately after my payment, even if it's 2am in the morning. 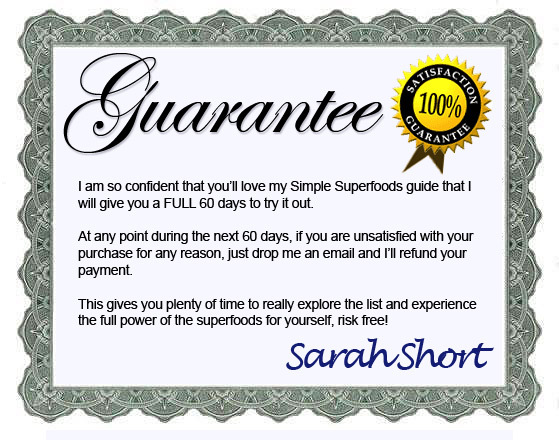 I understand that "Simple Superfoods" is covered by a 60 day money-back guarantee, and that all I have to do is send an email to Sarah to get a refund. Click the big yellow button below to order. If you're unsure whether "Simple Superfoods" is right for you, consider this. Today, you stand at a crossroads. To your left is your life as it is now. The same aches and pains, interrupted sleep, bad skin, dodgy digestion, slow days that seem to drag and the constant worry of illness. To your right is your new life, and a new you. A new you who glows with life and vitality every day. Who sleeps soundly, and springs out of bed in the morning, excited about the day. A new you who hardly ever gets ill, has beautiful soft skin, healthy hair and nails, a mind sharper than Albert Einstein and a heart as strong as an ox. But I know which I'd recommend! Change is hard. It can be scary, and difficult to commit to something new. But this change will be the best you've ever made, I promise you that. Plus, it'll probably be the easiest, the most fun, and the most rewarding! Click here to order now, and I'll see you in the members download area. P.S. - You're obviously unhappy with something in your life at the moment, or you wouldn't have ended up on my website. You can change whatever it is you're unhappy about using my superfoods guide, starting today. Sleep better, have better skin, be healthier, improve your memory and concentration, be full of energy, protect against heart disease and cancer... you can do all these things and more. Go ahead and order and get started in a few minutes. P.P.S. - The "Simple Superfoods" guide is usually priced at $49.95. For a limited time as a special promotion, the price has dropped to only $29.95 (that's a full 40% off). This can't last forever though, and I'll have to put the price back up to the regular price very soon. Don't miss out - order now and save $20. P.P.P.S. - Remember, when you download "Simple Superfoods" you are protected by our full money-back guarantee for 60 days. For any reason at any time in the next 60 days, send me an email and I'll refund your money. You have nothing to lose by giving it a try, and a whole lot to gain. Download the guide now and get started! ClickBank is a registered trademark of Keynetics, Inc. SimpleSuperfoods.com is not affiliated with, or endorsed by, ClickBank, Click Sales Inc., or Keynetics, Inc. THE STATEMENTS IN THIS WEBSITE AND ANY MATERIALS AVAILABLE FOR DOWNLOAD FROM IT HAVE NOT BEEN ASSESSED, REVIEWED, APPROVED OR ENDORSED BY THE FDA OR ANY OTHER GOVERNING FOOD OR HEALTH AND SAFETY BODIES. ALL INFORMATION ON AND FROM THIS WEBSITE IS FOR ENTERTAINMENT AND INFORMATIONAL PURPOSES ONLY, AND IS NOT INTENDED TO DIAGNOSE, TREAT, CURE OR PREVENT ANY DISEASE, ILLNESS OR MEDICAL CONDITION. THE AUTHOR DOES NOT CLAIM TO BE A DOCTOR OR NUTRITIONAL EXPERT, OR IN ANY WAY QUALIFIED TO GIVE ADVICE. THE CONTENTS OF THIS WEBSITE AND ANY MATERIALS AVAILABLE FOR DOWNLOAD FROM IT DOES NOT CONSTITUTE PROFESSIONAL OR MEDICAL ADVICE IN ANY WAY. IT IS UP TO YOU TO DO DUE DILIGENCE ON ANY INFORMATION YOU RECEIVE. YOUR HEALTH IS YOUR RESPONSIBILITY, AND ANY ACTION YOU TAKE AFTER READING THIS EBOOK OR THIS WEBSITE IS ENTIRELY YOUR OWN DECISION. IF YOU SUFFER FROM ANY ALLERGIES, PLEASE CHECK WITH YOUR DOCTOR OR A QUALIFIED NUTRITIONAL EXPERT BEFORE EATING ANY OF THE FOODS LISTED IN THIS WEBSITE AND ANY MATERIALS AVAILABLE FOR DOWNLOAD FROM IT, OR ACTING ON ANY OF THE INFORMATION FOUND WITHIN THIS WEBSITE. ALL INFORMATION IS CORRECT TO THE BEST OF THE AUTHOR'S KNOWLEDGE AT THE TIME OF WRITING, AND WAS RESEARCHED ONLINE FROM RELIABLE SOURCES. THE AUTHOR MAKES NO CLAIM THAT THE INFORMATION PROVIDED HEREIN PRESENTS A BALANCED VIEW OF THE RESEARCH CURRENTLY AVAILABLE, NOR THAT THE INFORMATION WILL STAY CORRECT AS FUTURE RESEARCH IS DONE AND NEW DISCOVERIES ARE MADE.